Early Learning Center of Milford | Mother of the Year... AGAIN! 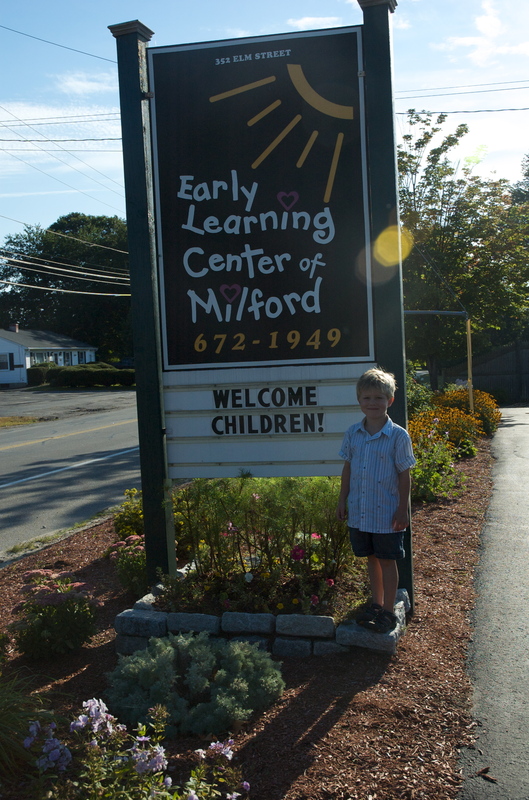 So… I just launched this site/blog for Reilly’s school, the Early Learning Center of Milford. I used wordpress to do it and was psyched at the flexibility in the template we selected. It’s super cool, if you get a chance, check it out, and let me know what you think. Summer has come to an end and Reilly will have some structure in his life once again. Today was the first day of Kindergarten for Reilly! He was pretty excited to be one of the big guys at his school given that this is his third year in this program. Unfortunately, Milford New Hampshire is one of the six towns in NH that STILL do not offer public kindergarten. It has been mandated by the state to have public Kindergarten offered in the fall of 09, so, 08 is another tuition-filled year for Reilly. I’m sorry, why do I pay property taxes that are comparable to our property taxes in California? It must not be for the public schools. Thankfully, it’s going to be a good growth year for him. He’s so eager and he’s anxious and he thinks he’s in complete control. He’s eager to read and to write in lower case letters and he is excited to talk about Math and the Presidents and more. He is craving learning in a way that has not been as obvious to us in the past. He tries to teach Shad and I stuff when he comes home as if he’s the only one who knows the information. It’s so exciting to see him enthusiastic and so confident that he is knows all this new information. Shad and I find it incredible as we watch him process information and try to grasp or make sense of new things. It’s invigorating in it’s own way.